and get half price tickets for everyone in your group. per adult and $22.99 per child (ages 4-12) using our coupon valid on Thursday, July 4th. 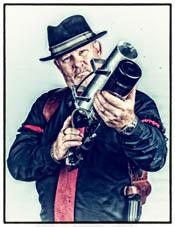 Instead of loud fireworks on this holiday, get in on the action during the gangster shoot out! Guests have a chance to win spectacular prizes. It's a blast! Dessert is also included with a special Independence Day Surprise Sweet Dessert. Since 1992 we’ve entertained guests with our one-of-a-kind prohibition era speakeasy. We hope you will enjoy the video (link below) and will spend some time browsing our web site where you'll find our menu, specials, more information about our show, guest comments, reviews and much, much more. Enjoy Capone's Dinner & Show this Independence Day, you'll be glad you did! We'll see you on Independence Day! Since 1992 we’ve entertained guests with our one-of-a-kind prohibition era speakeasy. We hope you will enjoy the video (link below) and will spend some time browsing our WEB SITE where you'll find our MENU, SPECIALS, more information about our SHOW, guest COMMENTS, REVIEWS and much, much more. Enjoy Capone's Dinner & Show this Mother's Day, you'll be glad you did! 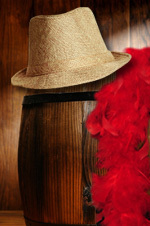 Buy your mom a feathered boa or a classy fedora to wear during your visit!